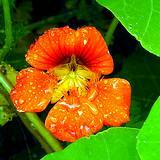 Nasturtium flowers and leaves add peppery taste to salads, herb vinegars, sandwiches, and even pizza. The immature pods can be pickled and used as capers. The flowers may also be chopped and used to flavor butters, cream cheese and vinegar. These annual edible flowers have cheerful cuplike flowers that Thomas Jefferson used to spice salads at Monticello. Nasturtium is available in diverse cultivars, including climbing and bushy types. By the late 1800's, breeders had developed many dwarf forms in a wide range of colors, and they became popular in bedding designs. Cottage gardeners often preferred the rambling old-fashioned types, letting them climb through other vines and spill over fences and trellises. 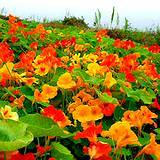 Nasturtium (Tropacolum majus) comes in bright colors such as orange, pink and yellow. Sow the seeds in spring in colder climates, or earlier in warmer zones. This edible flower prefers light, sandy soils in full sun, with partial shade in hot temperatures. It flowers best in less fertile soils. These edible flowers don't like to be planted in tightly packed soil or clay, and they enjoy a lot of moisture with good drainage. 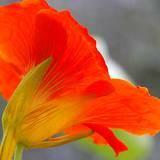 It's best to plant Nasturtium from seedling instead of seeds. The plants grow rapidly and easily. It's best to plant them outside, about one foot apart and about a quarter of an inch deep in the ground. Watch out for aphids, they seem to love that taste as much as people. Make sure you use a safe and organic spray to chase the aphids since you're probably planning on eating the flowers and leaves. The nasturtium is a versatile plant that can be used for edging in flowerbeds or in window boxes, patio containers, or hanging baskets. The flowers have a delicate fragrance that many people will remember from grandma's garden. Victorian women used it in tussie mussies to ward off bad smells. The large seeds of these edible flowers are easily held by tiny fingers, making them a good flower for children to help plant. In addition, the seeds germinate quickly and plants grow rapidly, so children can see the results of their nurturing soon. Only a small space is needed to provide a child with his or her own garden. Even a single foot square container can become a spring-to-fall garden. In the early spring, sow fast growing seeds like lettuce and radishes with the nasturtiums. By the time they are harvested, the nasturtiums will be ready to bloom until fall.